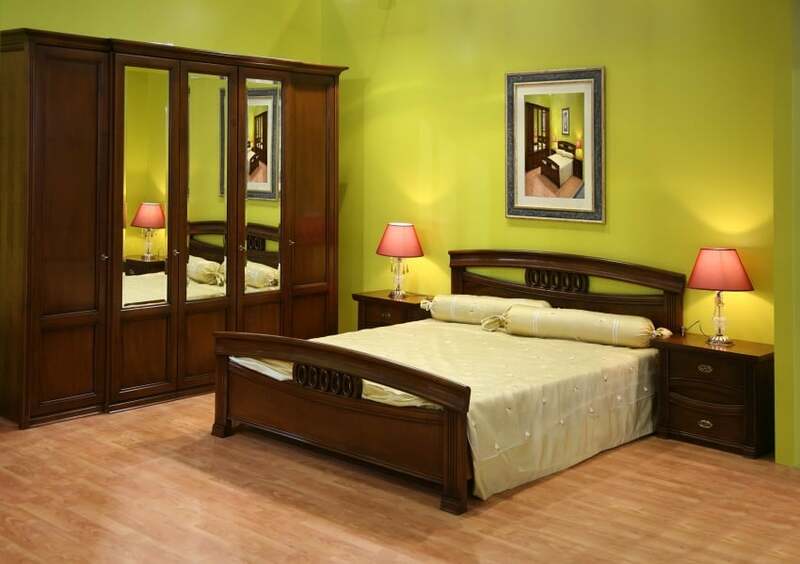 Welcome to our gallery picture collection of bedroom interior ideas. 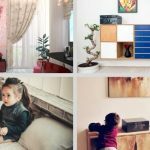 Have a look at the pictures below and if you want to see more design styles etc you can visit our entire collection of ideas for bedrooms here. A bedroom is a place where in one way or another we spend almost one third of a day. Therefore when we decide to choose the interior design and furniture of our bedroom we have to take into account both rest and relaxation. We must have in mind some of the most important factors to feel good and to get enough sleep to wake up refreshed and ready for a new day. Choose a bedroom theme that is close to your personality. 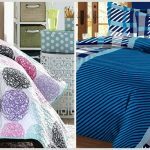 The design theme of your bedroom should be such that will release stress and anxiety from your body. If you are a romantic soul, do not bother with abstract geometric patterns; instead choose more earth tones and romantic bedding. 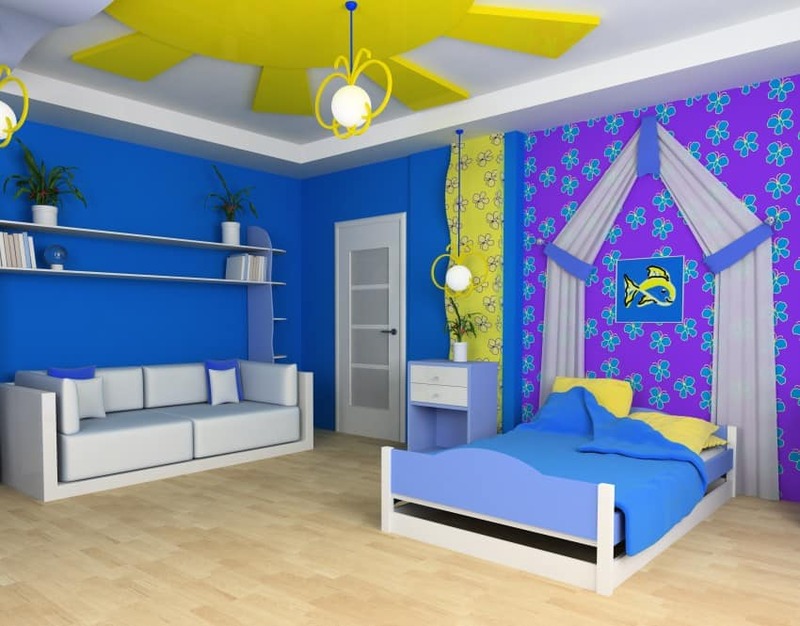 If you love the sea, the room should be in blue color shades and perhaps with added nautical details. Nothing destroys a perfect morning as quickly as ice-cold and hard floor in the bedroom. Get yourself a soft, warm and comfortable carpet for your first steps into a new day. A good mattress must be airy and it’s better to take the shape of your body. When buying a new mattress always read labels, ask about the material and if possible also try it. A good quality mattress will last you between 10 and 15 years, so don’t look into the cheap range on the price tag. 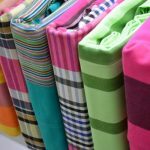 Although you may think that you do not need one in a bedroom, it comes in handy at those times when you just made the bed and you want to sit down to wear socks or shoes. Decorative pillows will make your bedroom even more attractive. But do not overdo it. Up to six pillows is somehow the right number that your bed will not be too “crowded”. Choose between different sizes and shapes, colors and textures. Nightstands are unsung heroes of the night, keeping your books, alarm clock and glass of water within reach. 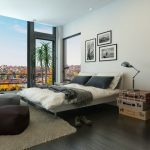 This beautiful modern bedroom in classic dark brown color is really a good choice for a big apartment or house with large rooms. 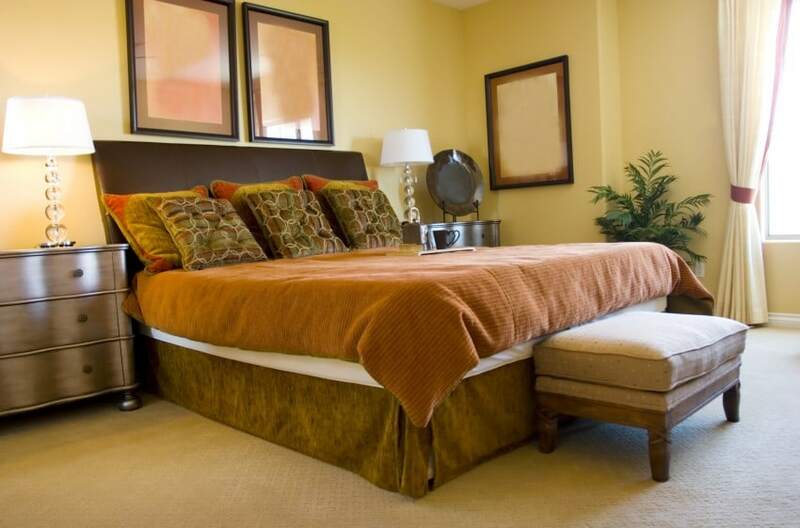 It includes huge California king bed and two beautifully designed nightstands in the same color as the bed. 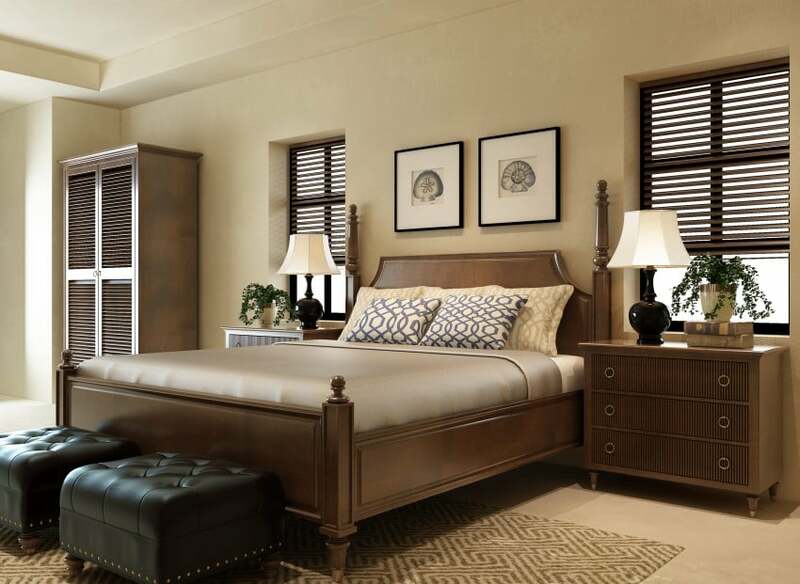 This is an elegant big modern bedroom in cozy dark brown color. Two hanging bedside cabinets are secured to the upper side of the king-sized bed. Two functional shelves are added to the sides of the bed. The bed is raised off the ground with hidden lighting below the bed. 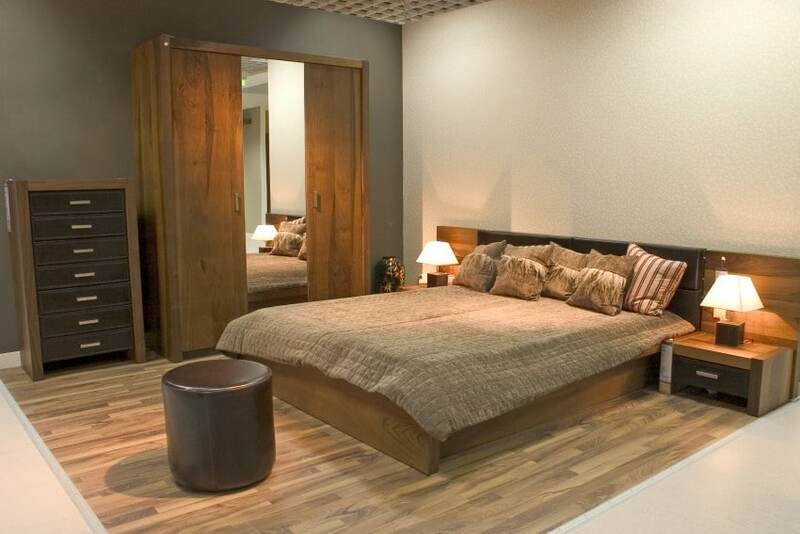 The bedroom includes a beautiful free-standing mirror. This beautiful and elegantly made modern bedroom has it all: a king-size bed, a wardrobe, two sets of drawers and two magnificently designed leather puff-style furniture. The large bed is decorated with beautifully designed details. The high wardrobe with a door in the form of blinds gives the bedroom a special appearance. 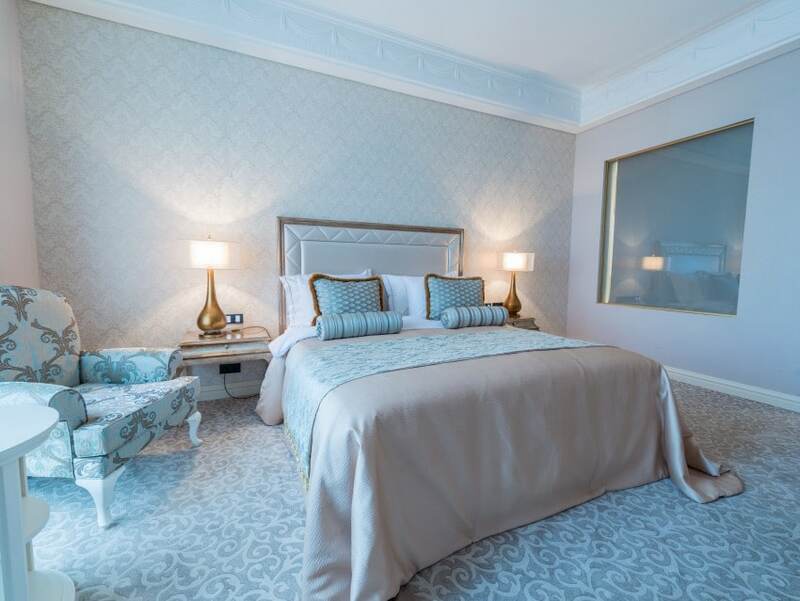 This beautiful luxury bedroom is designed for ultimate comfort and it takes you to a wonderful night’s sleep. Bedroom consists of a king-size bed, large spacious closets, two small and one large cabinet with drawers which offer a lot of storage space for all of your clothes. The round-shaped handles give this bedroom even more beautiful appearance. This pretty modern-style bedroom stands out for its appearance. It has a beautiful color combination of white and light blue. The king-size bed has a headboard with wonderful border in the form of a picture frame, which makes it something special, because it looks a little unusual. Small low nightstands have a narrow drawer and shelf at the bottom. This beautiful bedroom includes just the right lighting. The mirrors on the armoire beside the bed add just the right touch of elegance and make the room look bigger than it actually is. The red lampshades on each side of the bed help the overall lighting. The green walls with wood floor complete the room. This bedroom right here is perfect for anyone who enjoys candlelight. It is a known fact that candlelight makes for a nice relaxing and romantic atmosphere. Combine candlelight with a beautiful chandelier hanging next to a beautiful white bed, just as you see in this picture, and you will have the perfect setting to relax in, or for spending a romantic night with your partner. This beautifully decorated bedroom offers comfort and appeal all in one. The light beige walls, intertwined with the wood-colored wardrobe and wood floors take this room to a whole new level and add extra warmth in the area. The small white lamp on each side of the bedroom tops the room off and is exactly what it needs. 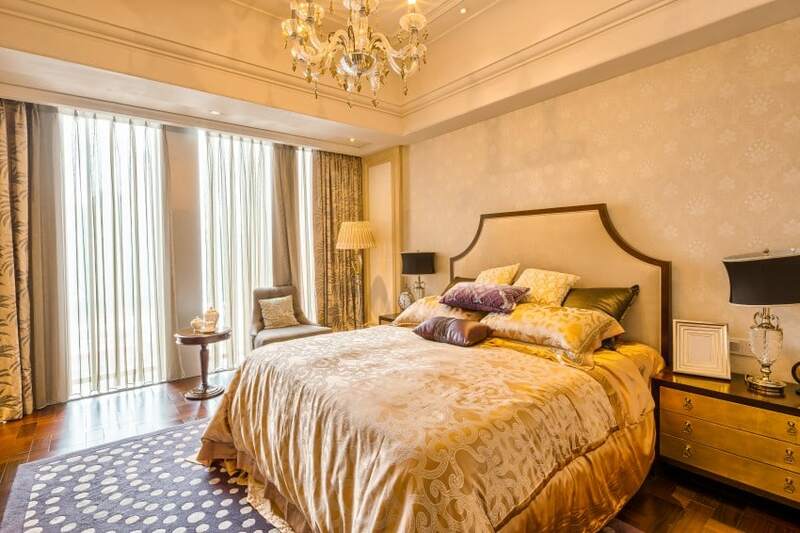 This luxurious bedroom has an amazing chandelier hanging right above the bed. The light colored walls make the black lampshades pop. The headboard, with the brown trim running around it makes for the perfect frame. The windows add to the luxurious appeal of the bedroom and will make you feel relaxed. 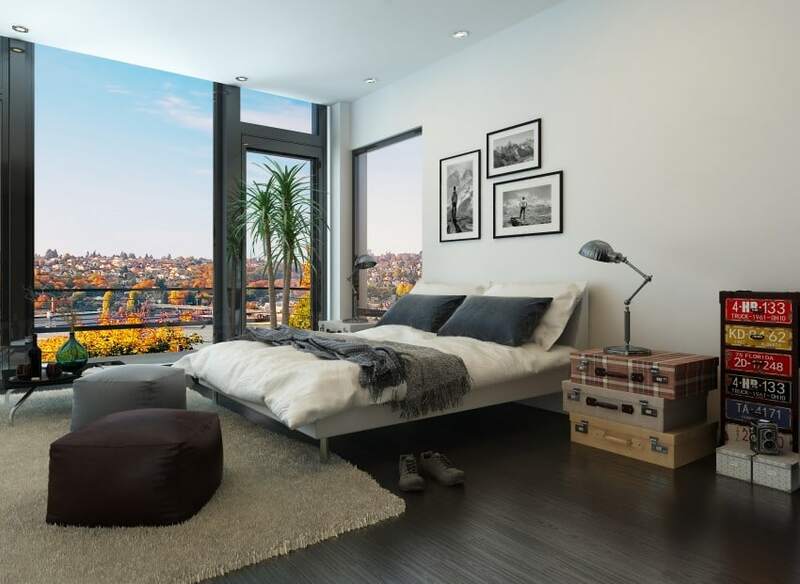 This bedroom offers an amazing view of the city. The modern style, mixed in with the rustic life (the tags on the drawers and the suitcases as a bedside table) makes this bedroom look appealing. It is sleek and modern. The white walls and dark colored floors add an extra appeal. With all of the pink (curtains, bed frame, couch and walls), this is obviously a room that was designed just for a little princess. The curtain accent hanging above the bed together with the pink flower picture in the center look gorgeous as decor. The chandelier hanging on top of the foot of the bed will make any little girl feel like a real princess. 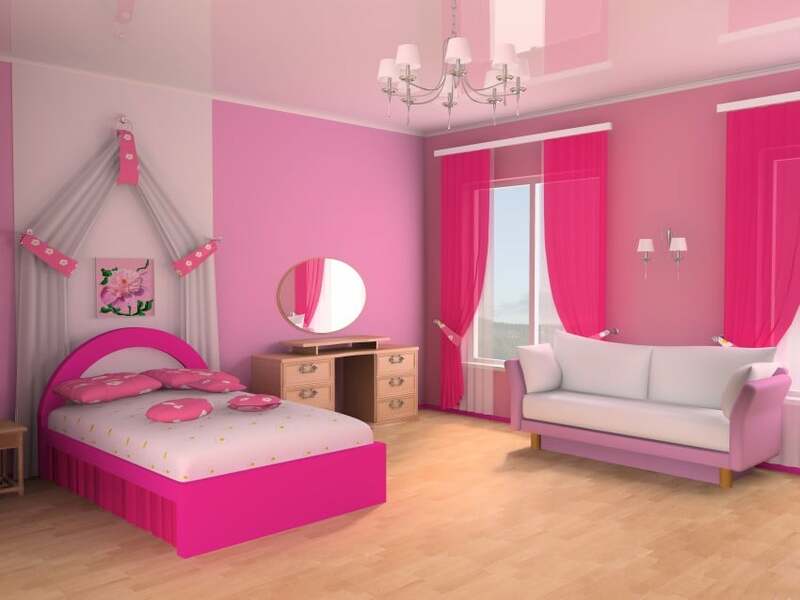 This is a beautiful bedroom that is perfect for girls of all ages. Everything from the bedding to the embellishments on the walls gives this room a suburban image. The two windows and the white vanity table make for the perfect scenery and the purple chair really adds to the room. This is the perfect setting for two kids. On one side, you have a crib, on the other side, you have a bed with a nice little armoire with a lovely red flower design. The netting hanging over the crib makes the room look luxurious, yet clean and simple. This is a great room for two children. The chandelier hanging in the middle of the room and the double desk sitting in front of the window makes for the perfect setting. The white curtains can be used to separate the sleeping area from the studying area. The dark colored blue walls with the white couch add a nice contrast. The pretty plants sitting up on the shelf above the couch give the room the right touch of nature. The yellow strip on the wall matches the yellow sun icon on the roof. The dark purple wall with light blue butterflies above the bed completes the room with a nice decoration. This bedroom has that classic, clean look to it. The white walls to the side make the entire room light up. The modern bed is sleek and comfortable, while the dresser is classic, yet astonishing. The entire atmosphere of this bedroom is cozy and relaxing. This master bedroom is great for people of all ages. Everything from the elegant comforter to the stool at the foot of the bed goes great in this bedroom. The lamps on the side table matches the big lamp over in the corner – the big bow tied around them makes them look unique. The big armoire against the wall has been perfectly placed and gives an older antique look to the whole room. This luxury bedroom with designer pillows is perfect for people of all ages. The loveseat nesting at the foot of the bed with the small round coffee tables doubles this bedroom as a sitting area. The plants on each side of the bedroom add just the right touch of nature. 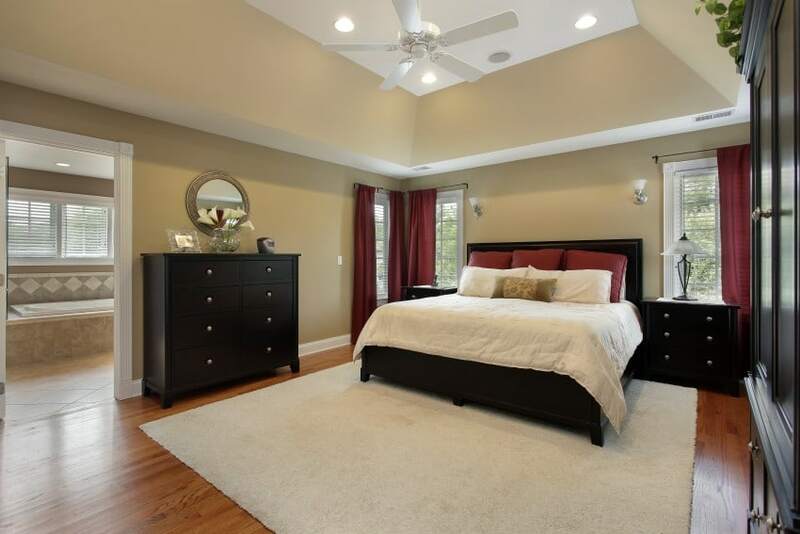 This master bedroom has been tastefully decorated. 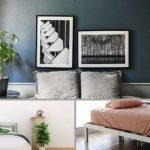 Everything from the lamps to the pictures on the wall to the plant, mirror and stool at the foot of the bed make the bedroom look clean, comfortable and tasteful. The cushions on the bedding with the circles match the décor of the lamp, which is pretty cool. 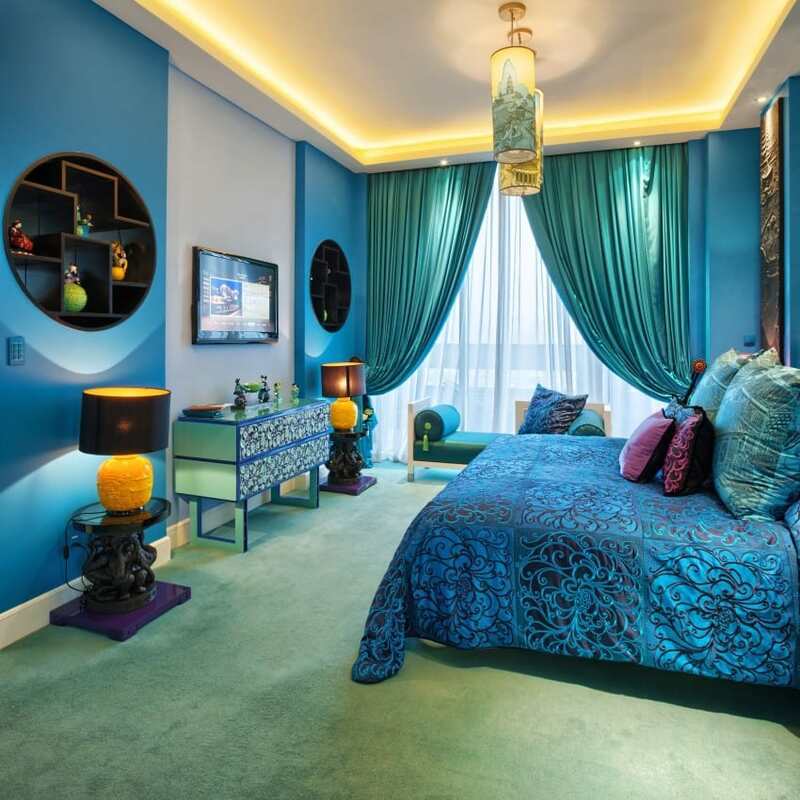 This beautifully decorated blue bedroom has the perfect Chinese setting. Avalokiteshvara (Guan yin) is holding the glass on the table. Guan Yin is known as the bodhisattva of infinite compassion in East Asian Buddhism, so having this in the décor of a Chinese room really adds to the style. The round shelving embedded inside the walls makes for an extra unique design.